Sudden summer temperatures (high in the mid nineties) made the peaches I picked on Monday ripen up fast. They turned out to be the most delectable peaches I've ever eaten, and I spent hours with sticky juices rolling down my chin. At long last, though, I admitted that we couldn't consume every one --- time to process the bounty. Earlier in the week, I had figured out the best thing to do with peaches that develop a rotten spot while still too hard to gnaw on. I cut off the good flesh and cooked it up in water over gentle heat, producing the most richly-flavored peach sauce ever. It turns out that those peaches were plenty ripe to eat without additional sweetening --- it was just the rock-hard flesh that was turning us away. 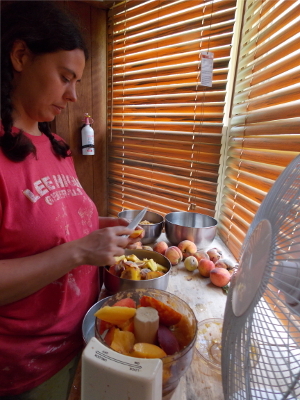 All of the peaches that were ripe by Wednesday afternoon filled up the dehydrator to capacity, but more were ready to go Thursday, and yet more will ripen over the weekend. I'm carefully managing my peach stores, segregating each day's pickings in one zone on the table so they're easy to tell apart from their cohorts, then plucking out fruits that develop the least sign of rot. 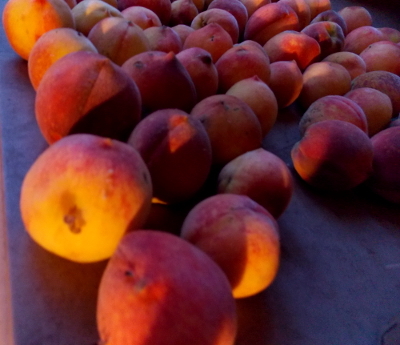 Oh, and breathing in the astonishing scent of a bushel of ripening peaches. Delectable! Our chicken waterer is the POOP-free way to hydrate chicks, hens, roosters, quail, turkeys, ducks, and more. Do you can or freeze any peaches? I like few jars of canned peaches for cobbler in the winter. tee --- We froze some peaches our first year, but were very disappointed by the result. I'd can peaches before I'd freeze them again, but prefer the flavor of leather since you get the uncooked fruit taste. So news is out that Mom and you are getting together. Does that mean I get a peach or peaches? Fingers crossed! Maggie --- You'll definitely get some peaches, plus summer squash, cucumbers, and probably something else we're overwhelmed by that I'm forgetting. So start menu planning. Anna how blessed you are to have so much peach produce. Peaches do not grow well in our area but apples and pears do. Just a little too cold a spring/fall weather I guess. That said I do not envy you having to work in a hot kitchen. Our raspberries are coming off in droves right now. I will make jam out of some of it but will be canning in the garage ( hot plates)as the heat is unbearable this week.